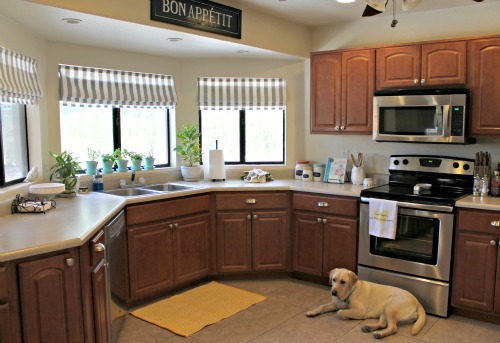 Yep, another kitchen post…I swear I have other projects coming up, but I’m trying to stick with one room instead of my usual design A.D.D. Anyway, today I want to show you my new kitchen rug! It’s actually the only rug in the house and the first quality rug I’ve ever purchased. 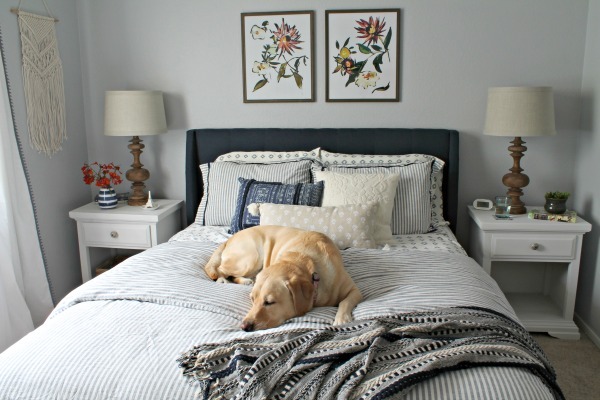 The rug I originally had in my kitchen mood board was charcoal gray, but after some thought, I decided to find a rug with a pop of color instead. 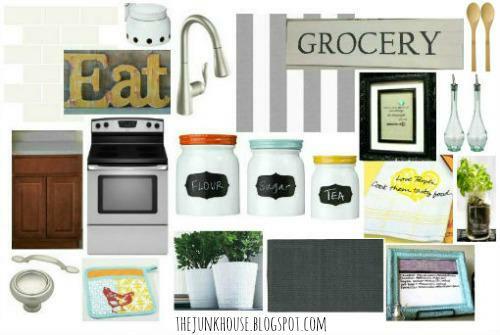 The curtains, countertops, and appliances are all gray-ish, so I thought a gray rug might be too much gray. Plus the room was due for some more color. 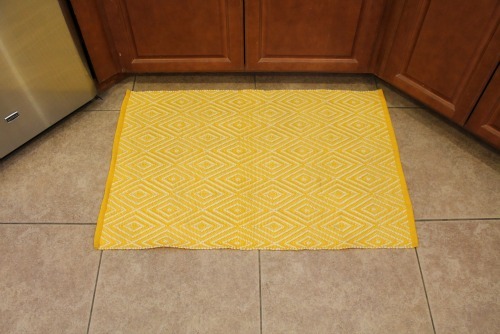 After a lot of searching and price comparing, I ended up buying this Dash & Albert diamond print rug in canary. It’s an indoor/outdoor rug, so it can be cleaned with a hose. Ringo and Abby always hang out in the kitchen with me while I cook, so that was a big selling point. If you look close you can already see dirt marks. I’ll be honest, I hated the color when I first saw it – I was hoping for mustard, but it was more marigold. My mom suggested that I use it anyway and give it a couple days before deciding to return it…especially since I’d have to pay return postage and a 25% restocking fee (I’d only end up getting about $20 back). As you can probably tell, the color grew on me and I’m happy with my rug purchase now. It makes the room look happier (and makes my feet feel happier). Speaking of, I have another fun purchase to share today: my new utensil holder. I saw this owl at Michael’s and thought it would make a fun utensil holder – better than a plain crock. It was 40%-off plus I had a coupon for an additional 20%-off, so I only paid a few dollars for it. The bamboo utensils are from Wal-Mart. Here you can see my new rug and owl utensil holder (and sweet Abby). I still have a few projects left, but I love how it’s turning out. It’s definitely more “me” than any of the other rooms in the house. Owl I can say is I'm glad you went with the owl. Owl-so the yellow rug makes me want to dance around your kitchen owl crazy like in joy. It would have been an owlful decision to return it. It makes my heart happy. Owl be looking forward to seeing your next post! LOL! I was going to comment back with more owl jokes, but I couldn't think of any. Owl leave the owl jokes to you! Love the way your kitchen is progressing and glad to know that I'm not the only decorator who has problems focusing on one room at the time. The rug is cute. And O MY I love the owl utensil holder!!! Cutest thing I have ever seen. LOL and Meaghan is cracking me up with her owlful comments. I'm not a huge yellow fan but I TOTALLY DIG THAT RUG! PS! You have a Chelsea Handler book on your page! She is my favorite. High five!! I'm reading "Are You There Vodka? It's Me, Chelsea" right now. I'm only on the second chapter, but it's hilarious so far! You are progressing quite well based from your list. I can say that it's definitely a space only for you. =) The rug really stands out on the room and adds a cheerful atmosphere to the space. 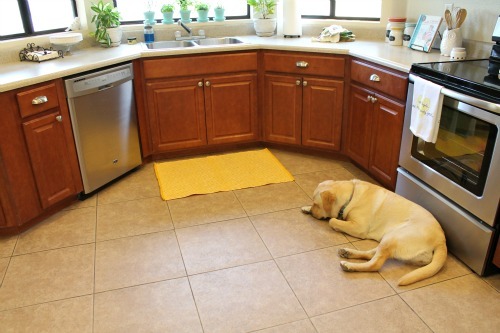 It's also easy to wash because it's very thin and light compared to other conventional rugs. Anyway, you have more jobs to do and I hope it will be done soon. Update us! 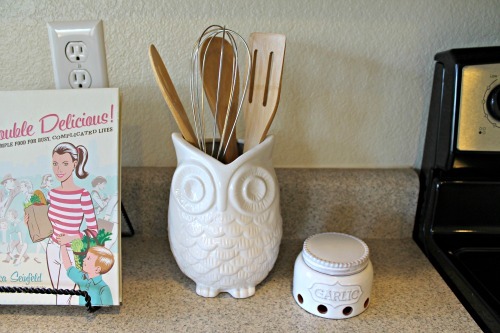 Oh your owl utensil holder inspired me to get a cute holder for my kitchen supplies! I didn't end up with the owl, but I did find one that I liked!